I know there are a lot of Nutella fans out there. Mr Steph is also obsessed with it, even mixing it with his beloved peanut butter - but that's another story for another day. 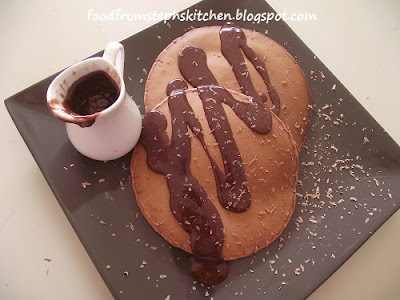 These Nutella pancakes are what I like to treat Mr Steph to on the weekend. They never fail to impress, and are always gone in an instant. 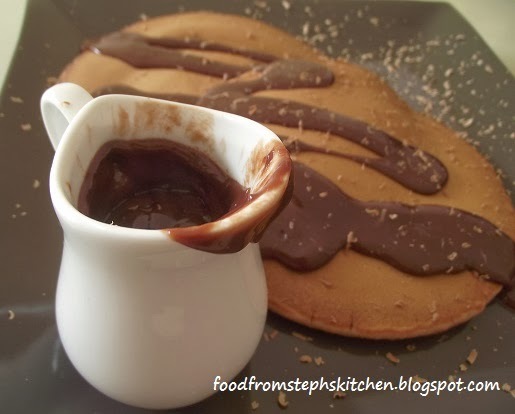 I like the addition of the Nutella pouring sauce as you can't really add the usual maple syrup to the pancakes; that would just be odd. You might be thinking 'Nutella on Nutella ... isn't that a bit too much?'. Actually with the thickened cream in the sauce it is more of a creamy chocolate sauce more than anything, and it puts the Nutella cherry on top. In a medium sized bowl whisk the egg and milk together until the egg has been evenly beaten. Next at the sugar. Now I only add a little bit of sugar mainly because I think the Nutella is sweet enough, but you can leave out the sugar altogether if you like. Sift the flours together and add the flour to your milk mixture about a 1/4 cup at a time, whisking until smooth before adding in more. If you don't feel like sifting so early in the morning (usually this is me) simply add in straight from your flour container; you might just need to whisk a little more to ensure there are no lumps. You might find it a little odd that I use plain and SR flour. This is actually something my Mum taught me; it makes your pancakes fluffy but still gives you that density you want in a pancake. Finally add your Nutella. You can warm it slightly in the microwave to make things a little easier but I often just add it straight into the mixture. If you do add it in straight from the jar you'll just have to whisk a little more until it's smooth. In a large electric pan or fry pan add a little bit of butter over a low heat. I find the lower heat is best for pancakes, especially large ones, as it allows the pancake to cook through without it burning on the bottom. I use my crepe creations pan which is just amazing. It's like an electric non-stick fry pan without the sides (featured in image below). I use it so much from my tortillas and crepes, to bacon and eggs if I find it easier. I really recommend if you are thinking about one (hint, hint so close to Christmas!). To make your pancakes all the same size use one of your cup measurements like a ladle. I use a 1/2 cup measure for the large pancakes, and a 1/4 cup measurement for the medium sized ones. If you want to do baby ones for the kids simply use a tablespoon measurement. It works a treat every time. only be about to fit one large pancake in the pan at a time. I know a lot of people get confused about when you need to flip your pancake. What you need to look for is small little bubbles appearing all over - from the edges to the middle (see in the picture below). Once these bubbles appear you can flip your pancake. Continue ladling and flipping until you have used all your mixture, adding a little more butter before each pancake. 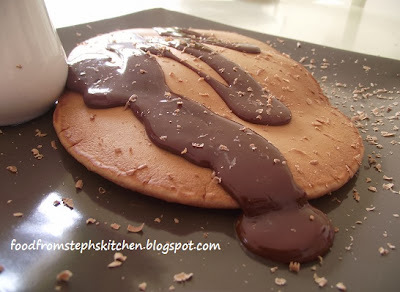 You can start the Nutella pouring sauce about half way through your pancake mixture, but if you are not good at multitasking simply cover your pancakes with foil and get to work on your sauce. The Nutella pouring sauce is really easy, and I like to make it for crepes or even ice cream sundaes as well. 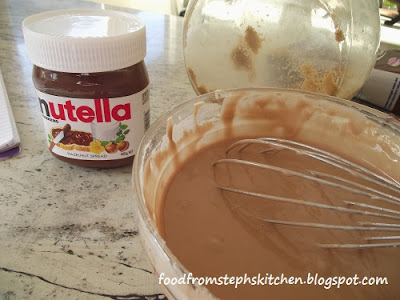 In a small pan add your Nutella and cream over a low heat, stirring until the Nutella has melted evenly into the cream. Allow the sauce to simmer until it thickens slightly (around 5 mins), never allowing the cream to boil. 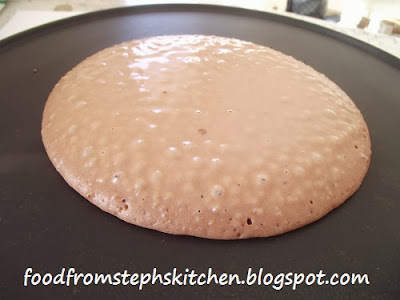 Once thickened it's really to pour straight onto your pancakes or into a pouring jug. Serve with ice cream or simply with the pancakes and the sauce. For a touch of something special you can grate some chocolate over the top just before serving.